Giuseppe “Peppino” D’Agostino was born in Messina in 1951. 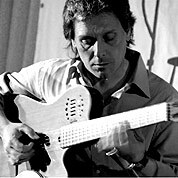 He was first drawn to the guitar after watching his cousin perform during church services in his hometown of Torino; the self-taught musician began picking out tunes by ear, and inspired by legends like Paco de Lucia, Leo Kottke and Carlos Santana, was composing and recording solo throughout Italy by the age of 18. Modern. 66 Measures. 8 Pages. Time Signature 4/4. Key of B.